Join us from 6:30-9pm on Thursday, November 17th, for the 7th annual Living Legends of the Dayton Daily News Archive as we honor sports writer Hal McCoy in the Endeavor Room of the Wright State Student Union. The doors open at 6:30pm and the program starts at 7pm. The event is free & open to the public. Hal McCoy, an Akron native, began his sports journalism career while attending Kent State University. 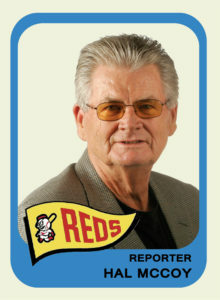 He joined the staff of the Dayton Daily News in 1967 and started covering the Cincinnati Reds in 1972. During his tenure he reported on The Big Red Machine, three World Series championships (1975, 1976, and 1990), and much, much more. Hal was inducted into the National Baseball Hall of Fame in 2003 and the Dayton Walk of Fame on September 22, 2016. In 2015, his latest book “The Real McCoy: My Half-Century with the Cincinnati Reds” was published. Please register by November 15th online or by calling 937-775-2092. Free parking will be available in Visitor’s Lot 2 by the Student Union. The series is a collaborative effort between the Wright State Department of Communication, College of Liberal Arts, the University Libraries and Special Collections & Archives. The Living Legends lecture series celebrates the Dayton Daily News Archive, an extensive collection donated to WSU by the newspaper. This entry was posted in SC&A and tagged Dayton Daily News, Dayton Daily News Archive, events, Living Legends, MS-458, news, outreach. Bookmark the permalink.